Sometimes you have to live with bad decisions made by those before you. I’m trying to rectify some mistakes by the previous owner without wholesale structural changes that wouldn’t be worth the space gained. The original foursquare house has been added onto a number of times. To the left is a mud room add-on. 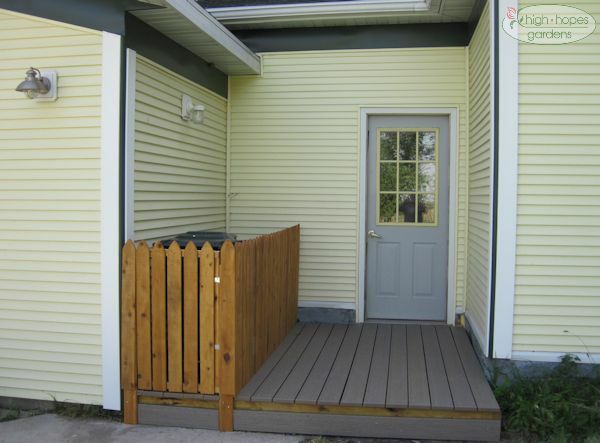 To the right of the door is a single-story add-on bedroom. There used to be a garage attached to the mud room. The best thing I ever did was tear off the attached garage. It was an attachment on an attachment and most irritatingly, it was built below grade, so every time it rained, the side of the garage attached to the house filled with water. An unforeseen bonus is the nice patio space that remains, shaded in the evening. The siding on this side of the house was new last year after tearing off the garage, a new wall needed to be built, so it was a good time to reside the whole side of the house. 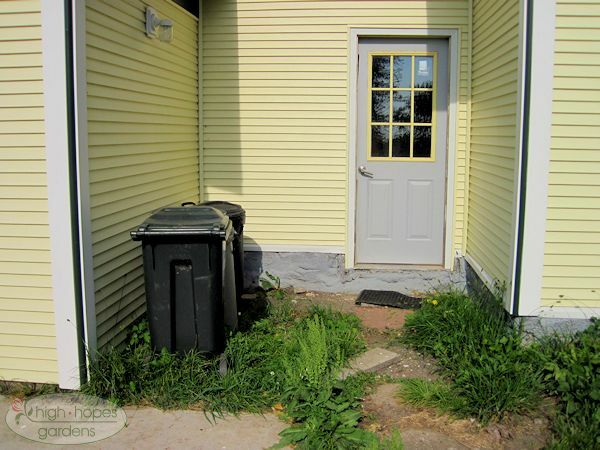 However, there is this rather crappy space between the two additions leading to the basement stairs. HBO came to Iowa to film part of a series on obesity. The following clip was taken from a roundtable discussion at Grinnell Heritage Farm. As a follow-up, Linda was later asked to go to D.C. present to the Institute of Medicine at the National Academy of Sciences. See the entire series free online at The Weight of the Nation. 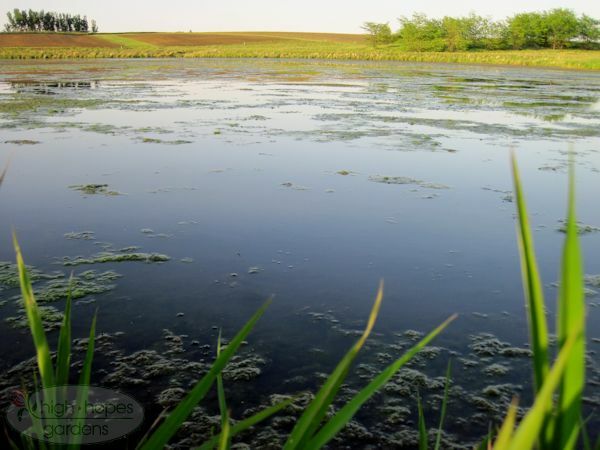 May 19, 2012 – Got Excess Nitrogen? Three years ago a fancy new nitrate-retention pond was built. The idea was for all the field drainage to collect in a wetland. to use up any excess nitrogen before tumbling away downstream and off to a river. This is what the upper pond looked like three years ago. There also was extensive grasslands around the ponds, but when we went to visit this year, most of those were plowed back up, after having been seeded to native plants just three years ago. Now, the lower pond shows signs of very high nitrogen (excess nitgrogen applied to farm fields and washed away). The masses of floating algae lumps have taken over the water. Unfortunately, most of the field drainage tiles lines are not fed into ponds like this and all that nitrogen is heading straight to the rivers and the dead zone in the Gulf of Mexico. Another classic turn of the century barn was put to rest. This is what the place where the barn used to be three days ago looks like now. Usually it’s the same story – some equipment comes, digs a big hole, pushes the destroyed barn into the hole, covers it up, and then corn/beans are planted on top of it. In the fifteen of so years we’ve been here, this is the sixth barn within two mile of our place to lose the turn of the century barn. May 12, 2012 – Who’s on First? It was a great “getting things done on the farm day.” It was the first day that Linda and Claire were home all day, so the garden and other things were transformed. 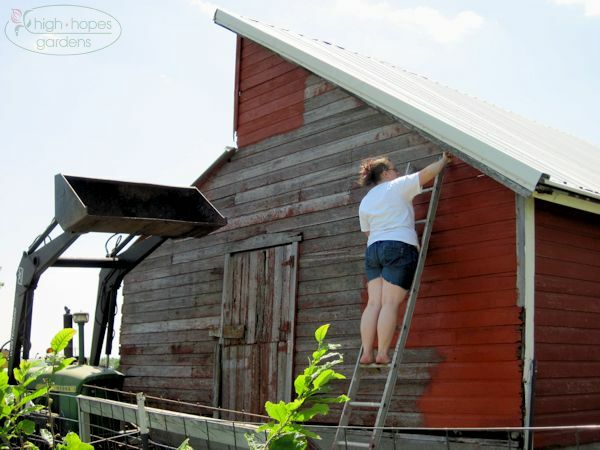 First, Claire volunteered to clean out winter from the hen house. 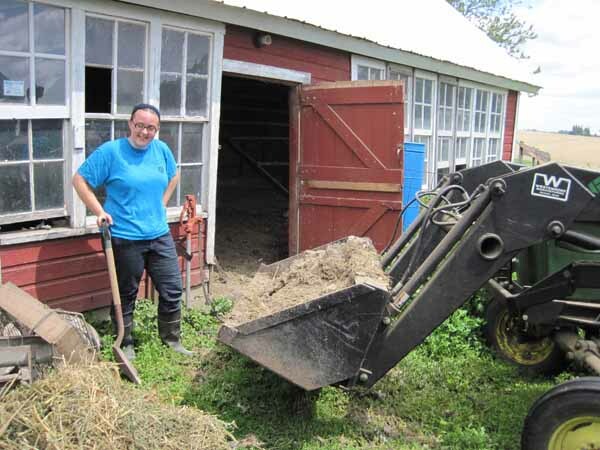 About five overflowing loader buckets (liberally soaked with water to aid the composting process) and the hen house was ready for fresh bedding, and next year’s compost is on the way. Many plants and seeds and mulch found their way into the garden as well. We got the recycled lumber tarps out of the barn, Linda planted a bunch of peppers and tomatoes. 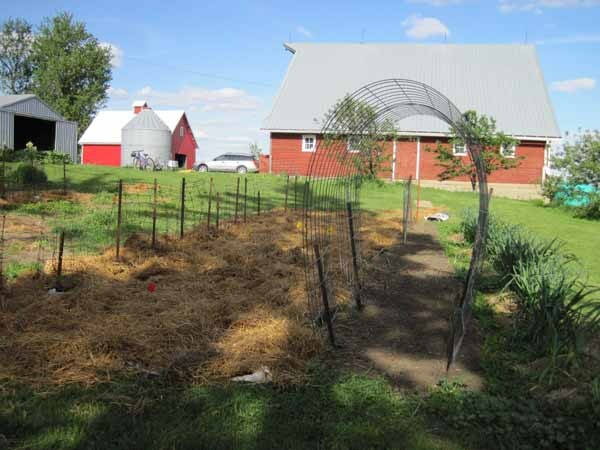 I went to the neighbors via the bumpy dirt trail between the crop fields and retrieved two loads of loose straw from the loft of their barn and put the tomato cages on, pounded the stakes in, spread the mulch and wet it all down. This photo shows some hearty garlic on the right, a cattle panel trellis that we put up this weekend. It has pole beans on the outside and lettuce and spinach underneath, hopefully to last a bit longer into the summer with the shade of the beans. To the left of the trellis is some space reserved for viney plants before a row of tomatoes. It’s nice to have that mulched portion of the garden already weeded for the whole season! At the end of the day, I took some time to pull thistles from the pasture. It appears that last year’s pulling them out by had greatly reduced the population in the paddock we tested last year. We’ll continue that on the other paddocks this year.